Palm Beach is home to a variety of dining options-everything from casual local favorites and beachfront dining to celebrity chefs and high-end fine dining. 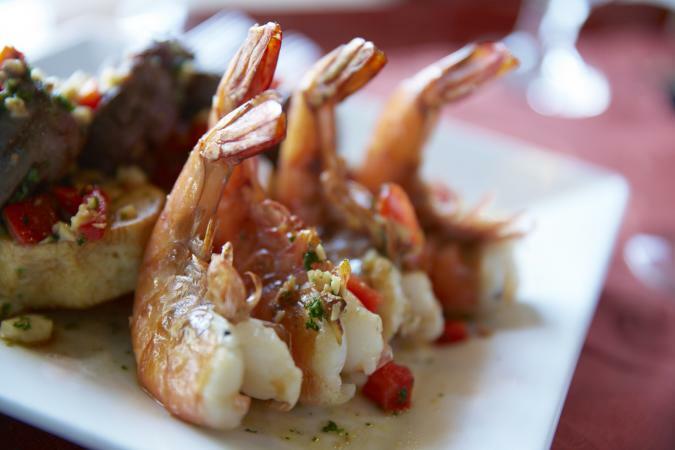 No matter what type of food you are looking for, you're likely to find it in Palm Beach. Looking to grab a casual breakfast or sit down for a nice brunch? Try one of these two iconic spots. 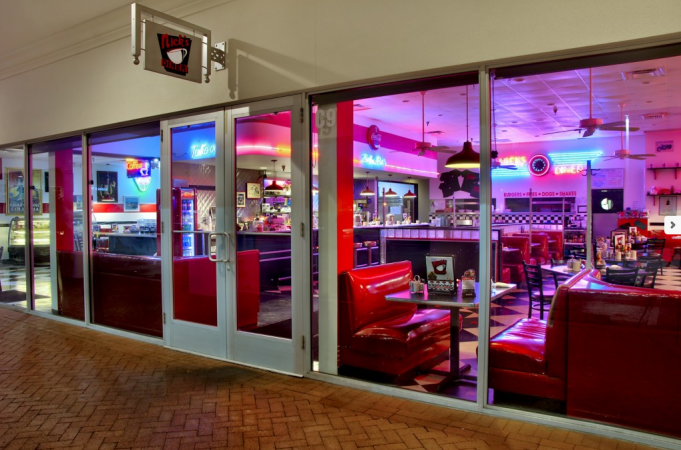 A neighborhood icon for over 25 years in West Palm Beach, Nick's 50's Diner is a popular spot for a delicious breakfast in a casual setting. Growing up in the 50s, Nick filled his diner with loads of memorabilia, including an authentic 1955 Seeburg jukebox. Today his daughter Alyssa is at the helm, ensuring Nick's remains a fan favorite. Aside from neighborhood locals who enjoy Nick's 50's Diner's homemade food, a number of celebrities and notable people have dined there, including Serena Williams who chose it as the site for her baby shower. Choose from menu staples like 7 oz. USDA Prime NY Strip & Eggs ($11.95) or Nick's Country Breakfast of biscuits and gravy, two eggs, hash browns, and grits ($8.95). Nick's offers daily specials you can find on their website and on Facebook. They may include sweet options like cornflake crusted French toast ($8.95) or waffle with fried chicken breast ($9.95). Nick's 50's Diner has been written up and recommended in a variety of publications, including being the number one pick for USA Today's 10 Best Breakfasts in Palm Beach. Some reviewers note it is very busy on weekends, so if you can plan for a weekday, you'll have a shorter wait. Hours: Monday to Saturday, 7 a.m. to 2:30 p.m., and Sunday 8 a.m. to 2 p.m. If you're looking for a brunch spot, Copeland & Co. Real Estate recommends Lynora's. Brunch is Saturday and Sunday only, and it does get busy, so expect to wait. They recommend calling ahead or getting there early, especially with larger groups. And, while an outdoor table might be faster, it is busy and crowded on Clematis Street, so it may ruin your ambiance. Lynora's was started by the Abbenante Family, who immigrated from a tiny island in Italy to Palm Beach. They started off selling pizza slices in Lake Worth. They use traditional family recipes and created quite a buzz in Palm Beach. The original location eventually closed, but their son wanted to bring back the family recipes people grew to love. He opened a modernized Lynora's and another location in Jupiter that has received good reviews. Regulars love Lynora's mix of traditional Italian menu items and unique brunch specials. Menu items include Lemon Ricotta Waffles with Walnuts ($12), White Chocolate Pancakes ($10), Nutella Stuffed French Toast ($12) and Brunch Pizza ($14) with scrambled egg, mozzarella, and bacon or sausage. You might assume that because Palm Beach is known for its glitz and glamour, all restaurants are over-the-top expensive. Like other cities, Palm Beach has a variety of inexpensive options, suitable for those on a budget. Also, check out Local Dines, where you can buy discounted certificates to some of the area's restaurants. One standout "cheap eats" spot in West Palm Beach is Bay Bay's Chicken & Waffles. They have multiple locations around the county and are known for their fresh, made-to-order chicken and waffles. Their fusion cuisine combines classic southern recipes with Asian, Latin, Italian, and Caribbean influences. Choose from two pieces of chicken (white for $11.95 or dark for $10.95), three pieces ($12.95), half chicken ($13.95) or eight jumbo wingettes ($12.95), served with a made-from-scratch sweet Belgium waffle. Bay Bay's Chicken & Waffles also have a variety of other Southern specialties like fried catfish and grits ($15.95) and a whole gourmet waffle menu with sweet and decadent treats like Apple Smoked Bacon Waffle ($9.95), Red Velvet Pecan Waffle ($9.95), and Peanut Butter and Jelly Waffle ($9.95). Bay Bay's Chicken & Waffles is no secret in the Palm Beach area, getting a mention in a number of posts and articles on eating on the cheap, including Palm Beach on the Cheap and Broward Palm Beach New Times' ten best inexpensive restaurants in Palm Beach County. Reviewers love Bay Bay's and rave about the quality of the fried chicken and waffles. Some reviewers note service can be a bit slow at times since it's a small place. And there is a charge for using your card (3.95%), so bring cash if you want to save some money. Also, they may run out of things in the evening, so it's best to go early if you have your heart set on a specific menu item. Given its proximity to water, it's no surprise that seafood plays a significant role in the cuisine of Palm Beach, Florida. If you're looking to try a delicious local catch, consider one of these options. PB Catch is a popular and highly rated raw bar in Palm Beach. It is one of the top recommendations from the Broward Palm Beach New Times paper. 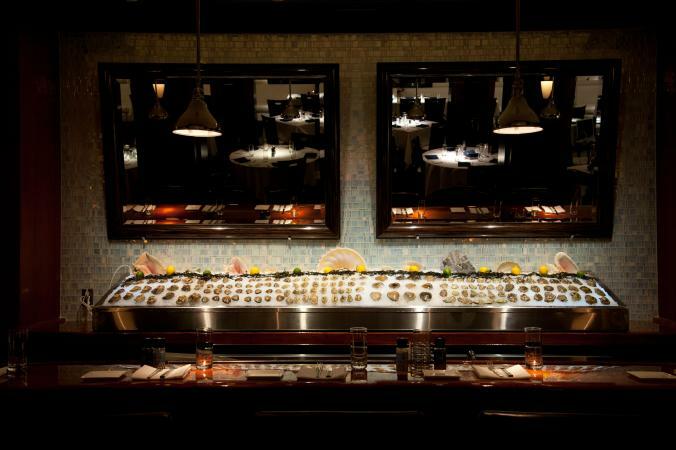 Choose from a wide variety of oysters-everything from Blue Point oysters from Long Island ($19 for a half-dozen) to Wiley Point oysters from Damariscotta River in Maine ($24 for a half-dozen). If you're with a group, try a platter that gives you oysters, clams, and shrimp instead. Another fun menu section is the "Seacuterie." Choose from three to six of the menu items, which are then served on a board like charcuterie. Some options include Cured White Tuna, Octopus Torchon, and Jalapeño Cured Hiramasa. Choose three for $18 or six for $34. Stop by PB Catch from 4:30 p.m. to 6:30 p.m. Monday through Saturday for happy hour specials like two-for-one drinks and oysters. Also, Thursday is their paella night. PB Catch accepts reservations through their website, which are recommended as they can get busy. Reviewers love the salmon pastrami on the "Seacuterie" menu and the house-made smoked fish dip. Hours: 4:30 p.m. to 6:30 p.m. for happy hour; dinner starts at 5:30 p.m.
USA Today 10 Best recommends Spoto's Oyster Bar as their number one pick for seafood in Palm Beach. Spoto's not only has good seafood, but also over 30 specialty bottle and draft beers. Spoto's also serves more than just raw seafood. Try local specialties like Bahamian Conch Chowder ($13.95) or sandwiches like the Mahi Reuben ($17.75). Hours: Sunday to Thursday, 11:30 a.m. to 10 p.m.; Friday and Saturday, 11:30 a.m. to 11 p.m.; happy hour every day from 3:30 p.m. to 6:30 p.m.
Palm Beach has no shortage of higher-end dining spots, great for a special night out. However, there a number of in-between spots that offer dishes you'd expect to see in a Michelin-starred restaurant, but without the higher price tag. Here are two of the more highly recommended options in Palm Beach. Buccan comes recommended by a number of sources, including by Liz Balmaseda, Food Editor of My Palm Beach Post, who declared Buccan is one of the best restaurants in the county. Forbes Travel Guide also gave a nod to Buccan as one of the hottest spots in town. Come early for brunch or enjoy dinner at Buccan. The cuisine has been described as "progressive American" fusion that draws flavors and culinary style from Asia, Latin America, and the Mediterranean. They are known for their "small plates," but serve larger entrees as well. Cold appetizers on the menu include Tuna Crisp ($17) and Steak Tartare ($14). Wood-fired dishes include PEI Mussels ($14) and Devils on Horseback chorizo stuffed dates ($14). Hungry diners won't want to miss some of the large plates like Yogurt Marinated Chicken with cashews, curried cauliflower, and mint yogurt ($28). If you can't get in for dinner, check out their sandwich shop around the corner that is open for lunch from 11 a.m. to 3:30 p.m. Hours: Sunday to Thursday, 5 p.m. to 10 p.m.; Friday and Saturday, 5 p.m. to 11 p.m.
Avocado Grill is owned by Julien Gremaud, who earned The Palm Beach Post's Best Indie Restaurant in the 2016 Critic's Choice Awards. Gremaud has done well considering he's already in the works to open a second Avocado Grill in town. With a comfortable laid-back vibe, try a variety of avocado dishes and enjoy locally sourced, hand-picked ingredients. Avocado fans will enjoy starters like Grilled Avocado Wedges ($12) and guacamole made with ginger ($13). Try small plates like Spiced Lamb Slider ($6.50) or Mushroom Fricassee ($12). There is a taco menu where you can choose from fish, steak, pork, or zucchini tempura tots (two for $13). Don't forget that they serve brunch as well. Choose from Traditional Eggs Benedict ($13) or go for a twist with A G Benedict with smoked salmon, spinach, avocado and truffle hollandaise ($16). Either way, be sure to save room for dessert and try either a Nutella Avocado Mousse ($7) or the Dulce de Leche Lava Cake ($7). Hours: Monday to Thursday, 4:30 p.m. to 10 p.m.; Friday and Saturday, 4:30 p.m. to 11 p.m.; Sunday, 4:30 p.m. to 9:30 p.m.; brunch 11 a.m. to 3 p.m..
Palm Beach is home to a number of notable chefs who have opened branches of their iconic restaurants or created entirely new offerings. One of the most notable ones is Café Boulud by James Beard Award winner Daniel Boulud. Discuss the dining scene in Palm Beach and you won't find anyone who hasn't heard of Café Boulud. Located at the exclusive Brazilian Court Hotel, Café Boulud is the brainchild of renowned French chef Daniel Boulud. Boulud owns 10 restaurants in New York City and others in Washington D.C., Boston, Miami, Montreal, Toronto, London, and Singapore. Originally from Lyon, France, chef Boulud worked for a number of three-Michelin-starred restaurants back in Europe, and when he came to the U.S. and opened Café Boulud, he received one star in the New York Michelin Guide. Café Boulud is open for breakfast, lunch and dinner. 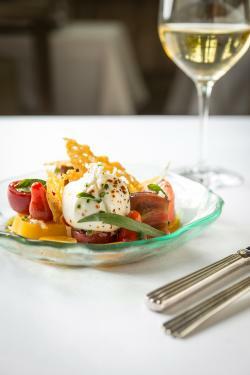 For September, try the three-course Lunch Prix Fixe menu Monday through Friday for $25 (from 12 p.m. to 2:30 p.m.). Options include Vichyssoise Salad, Bucatini Carbonara, and Key Lime Pie. At dinnertime, the prix fixe option is $45, Sunday through Thursday. If you can make it for lunch, you can save yourself $20, while still enjoying signature Boulud creations. Rick Mace is the executive chef and Julie Franceschini is the pastry chef at this Boulud location. Check their website as there are a number of scheduled events in the coming months, including wine pairing dinners. Reservations are essential here. You can call or book directly online through OpenTable. Shorts and beachwear are not permitted here and male guests should plan to wear a jacket during busier times of the year. Undecided on where to eat? How about sampling a few iconic dishes from the area's best restaurants? Food tours are an ideal way to get to know a city's cuisine and hidden culinary gems. Take a food tour at the beginning of your trip so you can choose which places you want to go back and visit on your own. You may also learn about places that weren't even on your radar. 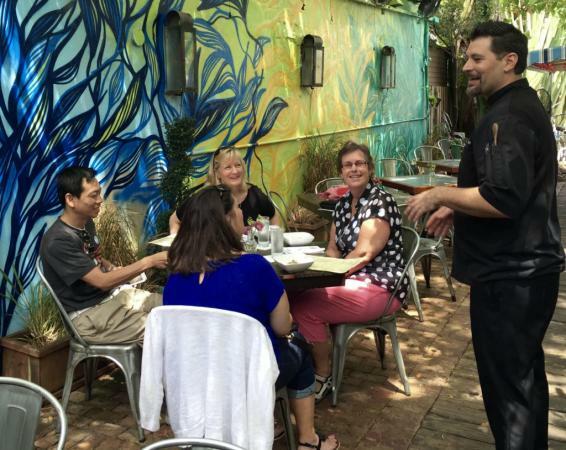 For the Palm Beach area, check out West Palm Beach Food Tours. Choose from a Downtown West Palm Beach Food Tour with 13 tastings from locally owned restaurants (three hours, $65), or book a market tour and cooking class (four hours, $95, offered seasonally). Another great option for learning about a destination's culinary scene is to find out where the local chefs dine. West Palm Beach Food Tours sat down with some of their favorite chefs to find out where they eat when not at work. The post on Where the Palm Beach Chefs Eat is a great resource to learn about why the chefs named these their top destinations. As you can see, dining out in Palm Beach runs the gamut from casual breakfast diners to celebrity chef hotel restaurants. Two important things to remember are to make your reservations as soon as you know your travel dates and to bring enough clothes. Some restaurants are not keen on the beach attire you wear out on the shores during the day.